This article is part of our series: a day in the software life, in which we ask researchers from all disciplines to discuss the tools that make their research possible. The threat of climate change and the need to reduce carbon emissions has gained the attention of many scientists and programmers working in the field of sustainability and human-computer interaction (HCI). One area in particular that has received close scrutiny is domestic energy reduction, where smart meters and ambient displays have been developed to increase awareness of energy waste, and sensors are deployed to automatically control a home’s energy expenditure. Yet missing from these developments is the fabric of the building itself. Retrofitting—the installation of energy efficiency measures such as increased or improved insulation, more efficient boilers, and the generation of energy through solar power—can reduce carbon emissions by between 45 and 80%. It can also cut energy bills and improve thermal comfort. 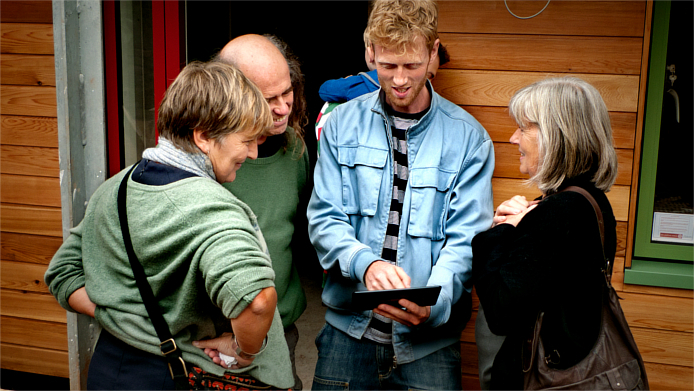 Community organisations such as our project partners, Bristol Green Doors, have sprung up across the UK with the goal of encouraging local residents to retrofit their homes. They do this through events where householders who have already installed such measures open their doors to the public. This allows visitors to see the measures in action, ask questions about the householder’s experience, and learn from others within their community. 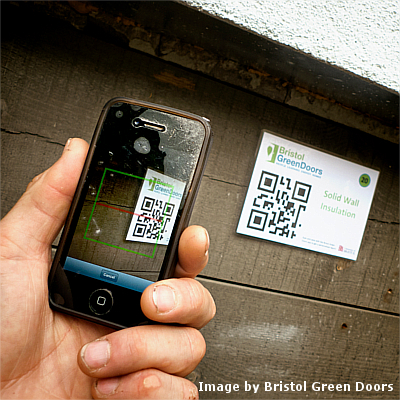 Working closely with Bristol Green Doors, we explored how technology could be used to support and enhance their existing work. Ideas that emerged from a series of brainstorming workshops were filtered for feasibility, and we decided that a smartphone app with a focus on navigation and data collection would be the most suitable project to pursue. The app proving popular with its users. Image by Bristol Green Doors. These included a map view and list view of participating houses, a series of location based services, including route planning, methods of filtering house properties and saving favourites to a shortlist, contacting householders through an anonymous relay system and barcode scanning for easy collection of information. The information that users collect through the app is aggregated by a server backend into a personal report that includes detailed information about the energy efficiency measure, its cost and the level of disruption required to install it, and curated references to additional information. The effort involved in collecting and processing such details is often cited as a reason why people fail to retrofit, and we hope that assembling these details in one place helps reduce this barrier. The app in action. Image by Bristol Green Doors. While we believe that apps provide a still largely untapped potential for academic researchers, there are some things to consider. Firstly, the nature of an academic research project requires qualitative and quantitative data be collected to evaluate the effectiveness of the app. The data required needs to be decided from the start, especially any quantitative data collected by the app itself. Secondly, while the research project comes to a natural end, the community organization goes on. However, maintenance of a server backend and app requires significant amount of technical expertise that is frequently too expensive for such small organisations to acquire. Researchers can maximize impact if the long-term maintenance of the app is part of the initial design. This can include adding monetization features that might not be part of the core research question, but which allow the app to become self-funding and self-sustaining.